Ex 10.3, 5 Show that each of the given three vectors is a unit vector: 1 7 (2 + 3 + 6 ), 1 7 (3 6 + 2 ), 1 7 (6 + 2 3 ), Also, show that they are mutually perpendicular to each other. = 1 7 (2 + 3 + 6 ) = 2 7 + 3 7 + 6 7 = 1 7 (3 6 + 2 ) = 3 7 6 7 + 2 7 = 1 7 (6 + 2 - 3 ) = 6 7 + 2 7 3 7 Magnitude of = 2 7 2 + 3 7 2 + 6 7 2 = 4 49 + 9 49 + 36 49 = 49 49 = 1 Since = 1 So, is a unit vector. Magnitude of = 3 7 2 + 6 7 2 + 2 7 2 = 9 49 + 36 49 + 4 49 = 49 49 = 1 Since = 1 So, is a unit vector. 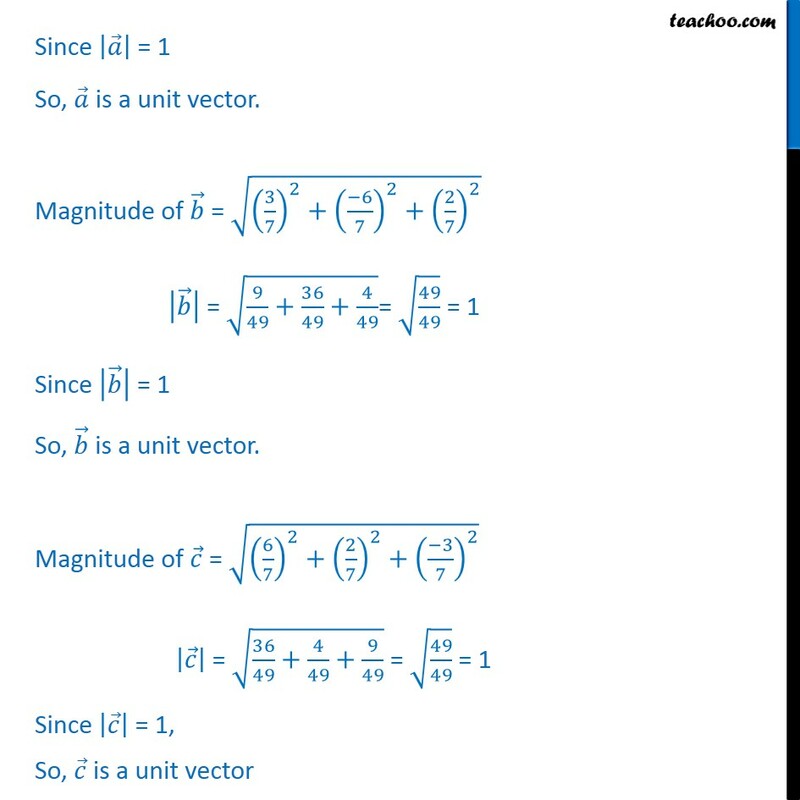 Magnitude of = 6 7 2 + 2 7 2 + 3 7 2 = 36 49 + 4 49 + 9 49 = 49 49 = 1 Since = 1, So, is a unit vector Now, we need to show that they are mutually perpendicular to each other. So, . = . = . 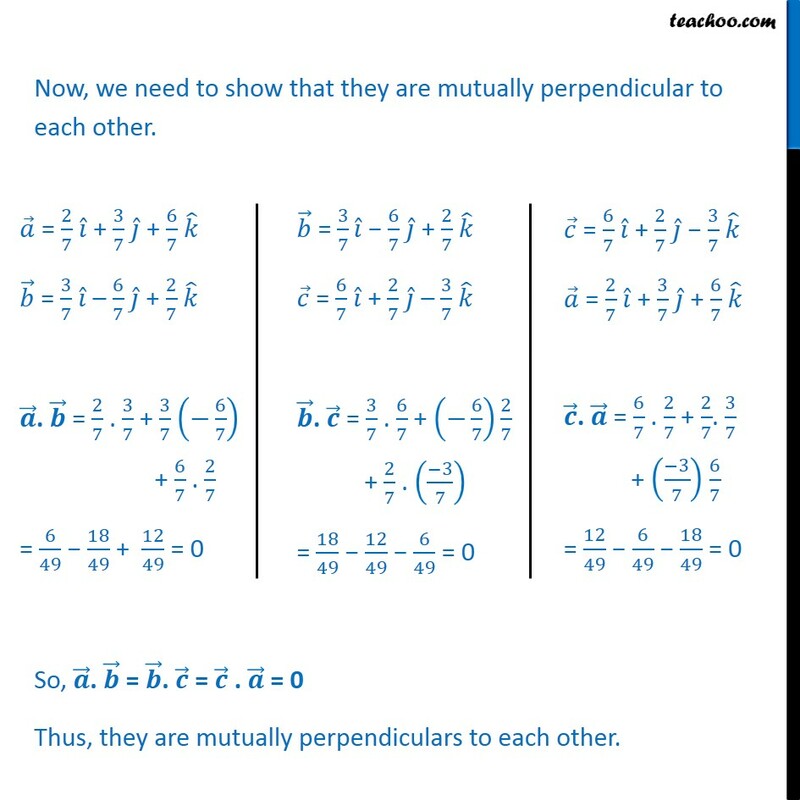 = 0 Thus, they are mutually perpendiculars to each other.